Message Boards - Boba Fett Fan Club → Fans → Boba Dude and Surgery! Re: Boba Dude and Surgery! Jezz, no offense or anything, but, it looks like something that crawled out from like a sci-fi movie or something. Wow! So that's your skull in those pictures? How did you get the tumor anyway? It looks fairly big. And it came out of me!! Well everybody I have an update! Glad to hear you're on the mend. Did they sew up your scalp, or did they leave the metal exposed like the guy from "Texas Chainsaw Massacre II"? Just don't scratch at it with a bent coathanger hook. PS... stop using your celphone so much. Wow, so glad that you're ok! Alright, now for the medical geek in me, those scans are so neat!! My dad used to work in x-ray and cardiology, and now works in nuc. medicine, so these kinda images always fascinate me. So, thanks for sharing! What did they do with the tumor? I've always wondered about these things....I had a ligament wrapped around my intestines a few years ago and I never even got the see it, I was kinda hoping they would put it in a jar or something for me. i never knew you before, but im glad youre better! titanium head.... aaaaaaaaaaaawwwwwwwweeeeeeeeeesome! Everything was geting kinda lonely here without you. * Shudders * I have some bad memories from the hospital. Anyone screwing around with your head ain't fun.. I got a concussion back in July and had a gash in my scalp that required stitches. Oh, that was fun with my long hair. So, are you going to set off the metal detectors in the airport? Will the metal portion of your skull be stronger than the bone? Titanium is a very hard metal. They took it too a lab and tested it. The tumor is rare so the know almost nothing about it. No I won't set off metal detectors. My head will never be "as" strong as it was. But in the question you asked, yes. 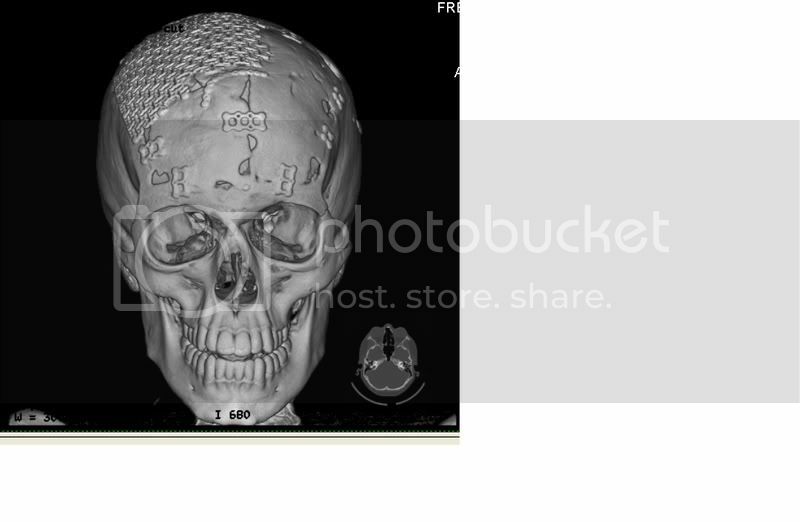 Looks like the tumor involved the bone since they ran off with part of your skull. Bone tumors tend to hang out for a long time until they get big enough to notice. Wear a helmet if you gotta get your kicks bike riding or something. It will save you a lot of trouble. Wow! I thought getting titanium rods in my back was bad! I hope you are doing ok, I know what it's like to go through major surgery. Does this mean he's a Cyborg? No I am not a cyborg Humorbot, I have no computer crap in me. Puking stomach acid all day is NOT fun at all. Thank God for Childrens Hospitl. By definition, you are a cyborg. If they took out that patch of skin with the skin, how did cover up the titanium? I always wanted to know if titanium could block a bullet. I will just have to meet you and find out, first hand . Cyborg - A person whose physiological functioning is aided by or dependent upon a mechanical or electronic device. Technically he is not a cyborg as he his not kept alive by a mechanical or electronic device. But I can see how someone might think that. Darth Vader is a cyborg. I agree with Jacsveus, I am not a cyborg! There is no mechanical or electronic device's in me. draco fett, I don't really know if titanium is bullet proof. Glad to see you back, Boba Dude! Thank heavens it wasn't cancerous! Wicked pictures, by the way. Most I ever had done to me was in August when I got my wisdom teeth taken out, it hurt like heck. I lived on slushies and crushed popsicles for a week. My Mother gave me and ARC a gift at dinner yesterday. guess what it was? The newest pic of MY head, ON A SHIRT! I am soooo wearing it to school today! Again, thanks for everbody's support. The place rocks, everybody is SOOOOOOOO nice here! I was joking about his skull stopping a bullet. According tho my dictionary, a cyborg is "a being, usually human, who has mechanical or metallic implants." We are getting rather off topic however.